The Institute for Tropical Medicine (ITM) was established over a century ago. We began by training doctors and nurses to work in the Congo and are now internationally recognised in the fields of education, medicine, science and world health. The castle in Parc Duden in Brussels. 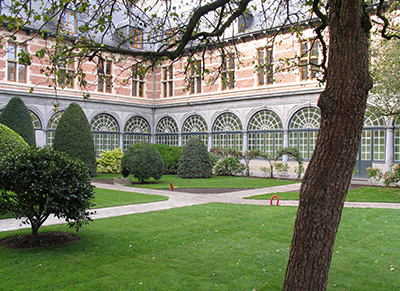 In 1906, in an old villa in Brussels, King Leopold II established a school devoted to the study of tropical diseases (the School voor Tropenziekten). He wanted to train doctors and nurses to allow them to work in the Congo Free State. There were similar tropical institutions in England, France, Germany, the Netherlands and Portugal. 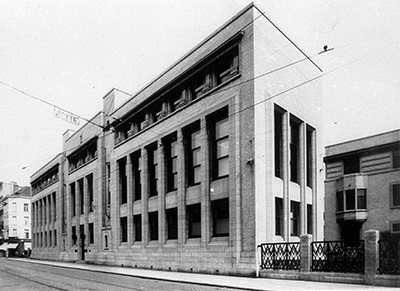 In 1933, the school joined forces with the Kliniek Leopold II voor Tropenziekten and moved, under the influence of the future Leopold III, to a characteristic Art Deco building in Antwerp, just a short distance from the harbour docks serving the Congo. 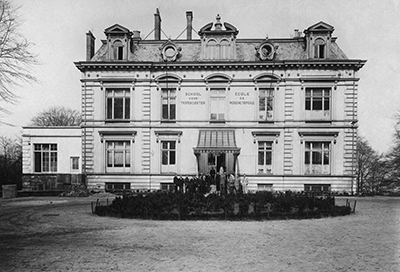 The Prins Leopold Instituut voor Tropische Geneeskunde, known in English as the Institute for Tropical Medicine, was born. For several years, the ITM continued to be an educational institution for people going to the tropics and a hospital for people who returned from there needing treatment. The majority of the professors were people who had lived in the colonies. In 1960, the Congo became independent. The ITM stopped training colonists, but continued to train people who assisted with development in the Congo regions. In 1964, we expanded to offer courses on veterinary care for tropical animals. Our students now come from all around the world. And our professors also give lessons in developing countries. Good academic education is not possible without scientific research. As such, since the 1970s, we have been performing more research in the developing countries themselves. The result? We also started providing medical assistance and now work in collaboration with local researchers, institutions and authorities. Besides treating and preventing disease, we fight the socio-economic factors behind them. We study epidemics and design public health systems. The Institute for Tropical Medicine has been looking for remedies for Sexually Transmitted Diseases (STDs) since its inception. Since the 1980s we have also focused on AIDS; our researchers even discovered that AIDS originated in Africa and laid the foundations for current international research into AIDS and HIV. One of these researchers was Peter Piot, who later became director of UNAIDS (between 1994 and 2008). Wallonia has no tropical institute of its own. This is why the ITM also organises training for French-speaking doctors and nurses. They receive targeted training and support to establish health services in developing countries and perform their own biomedical research. This has brought about the creation of the international course Master in Disease Control. In 1993, the ITM strengthened its connection with Belgian universities. All Flemish universities are now represented on our board of directors. In mutual agreement, the board of directors also co-opted the three French-speaking universities from our international Scientific Board of Advice. In 1996, the ITM further consolidated these university links with collaborations for education, research and doctoral training. For our financing, we particularly depend on project funding, our own income and patronage. We also receive subsidies from the government. Since 1997, the ministries of Public Health and Social Affairs have officially supported the ITM as a reference centre for tropical diseases and HIV/AIDS. Since 1998, the Directorate General of Developmental Cooperation and Humanitarian Help (DGD) has financed a number of research projects and framework agreements. In 1999, the Flemish government named the ITM as an institution of public importance for post-initial education, scientific research and scientific services. This qualified the ITM for certain subsidies. Since 2007, the ITM has had access to research scholarships from the ministry for Scientific Policy. By 2001, there were three times as many scientists working at the ITM as when it began. As such, we needed to look for an extra campus. By coincidence, the seventeenth-century convent further up the street was to be put up for sale. With financial support from the department of Monuments and Landscapes, the national lottery and the department of Education, we were able to transform this beautiful, protected monument into a modern education campus. These renovation works were completed in 2006, just in time to acknowledge our centenary. The veterinarians also have a campus of their own. In 2002, they moved to the Mortelmansgebouw in the Kronenburgstraat. The ITM is internationally recognised as a Centre of Excellence. But we are even more than that; a key player in an international network with dozens of partner institutions. We help them to increase their capacity for research and health care. And together we strive for: Health Care for All.